A new picture of Tommy Ladnier, aged c. 12-14, has been found. Besides being the earliest Tommy Ladnier photo, it also indicates a solution to one important question. Tommy stated that he did not own a horn himself until he had played for years in Mandeville. 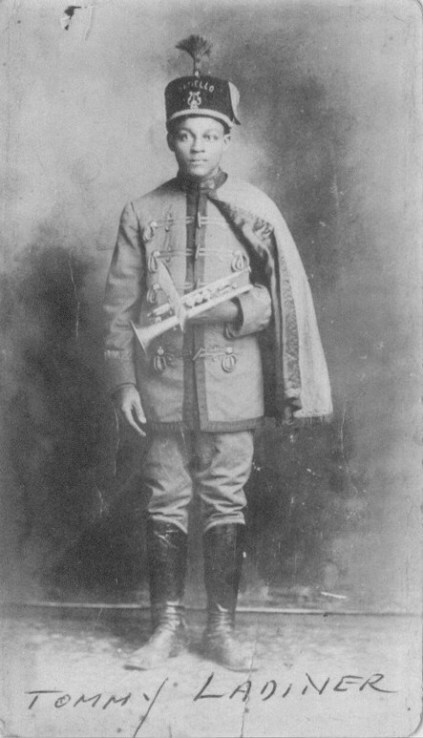 This picture shows that he was a member of a local brass band and that he probably could loan or keep this horn between rehearsals and parades. Another interesting thing is that the horn has a music sheet attachment. Tommy Ladnier probably wasn’t too familiar with reading music after all? This photo also displays one of the common misspellings of the name Ladnier: Ladiner was often used in press items by the Chicago Defender. Pronounce Ladnier in a common Louisianan way and you will perhaps understand the mistake. Any information on this brass band (Othello?) will be appreciated.